The Commander Series boxes give you the ability to quickly access your gear at the tailgate of your truck. With our Patented Load&Lock System® giving you the option to quickly release and remove the box. The 7″ solid rubber wheels make it easy to take this box anywhere on and off road. Exclusively designed to fit under any tonneau cover or camper shell. Produced from rugged Aluminum Diamond plate and Stainless Steel components, giving you piece of mind from weather and thieves for years of dependability. 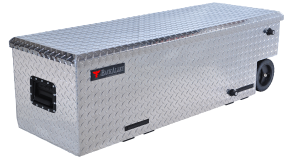 Offered in Bright Aluminum or Rugged Powder Coat, these boxes give you a storage capacity of 8 cu ft. Designed to work with all Tonneau covers.